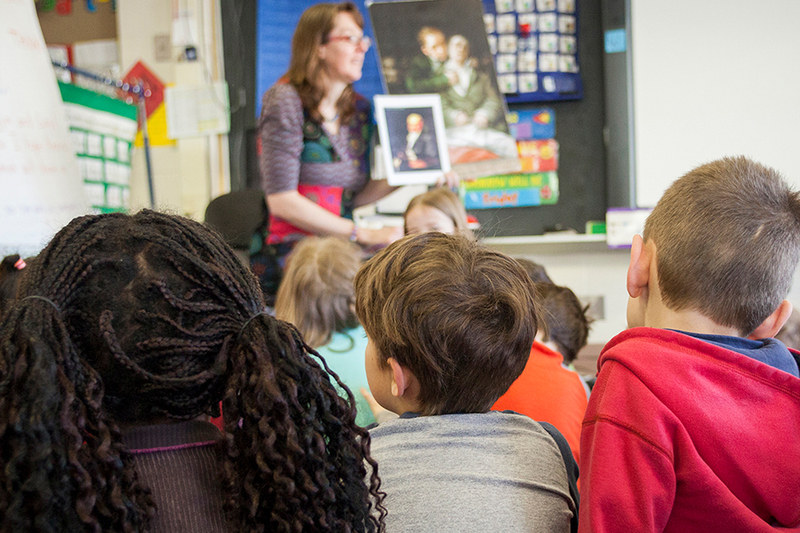 Art Adventure is a program that engages students with artworks from the Minneapolis Institute of Art’s collection and through the support of thousands of trained, school volunteers, sends visual arts into K-6 classrooms across Minnesota and beyond. The program encourages creativity, critical thinking and global awareness through in-depth explorations of art across various cultures and time periods. Art Adventure is an opportunity for students to experience art up close and personal through reproductions, technology and touch-and-feel props. Take a peek at a sample artwork lesson! Every school must have a designated coordinator to serve as the main contact for the school. Coordinators are responsible for reserving an Art Adventure set, recruiting and registering volunteers for training, picking up and returning the Art Adventure set, and requesting an Art Adventure tour. Picture People are school volunteers that come to the museum for training and then go into classrooms to facilitate conversation and learning. Each theme is offered at least twice a month, once in the morning and once in the evening. You only need to attend training once. Like what you have seen? Interested in having Art Adventure at your school? For more information call (612) 870-3056. Looking for other online resources? Visit these sites for more information! The National Gallery of Art, D.C.
Tuesday and Wednesday: 10:00 a.m. – 5:00 p.m.
Thursday and Friday: 10:00 a.m. – 9:00 p.m. Pick-up and return your Art Adventure set at the School Services area located in the lobby of the 3rd Avenue entrance. Look at your confirmation packet to verify the specific dates of your set rental. The easiest way to buy postcards or additional booklets is when you come to training. If you need to make a purchase on another day, please contact ArtAdventure@artsmia.org to make other arrangements. Phone Reservation Day is in early April and sets are available on a first-come first-served basis from then on. To reserve a set now, please e-mail ArtAdventure@artsmia.org. Tour requests can be made using this link. Click here. For all other questions, please e-mail ArtAdventure@artsmia.org.